Last week I went to Tilburg to buy me some glass. They had lots including all kinds of colored plates. Red jumped out. Ruby red to be exact. 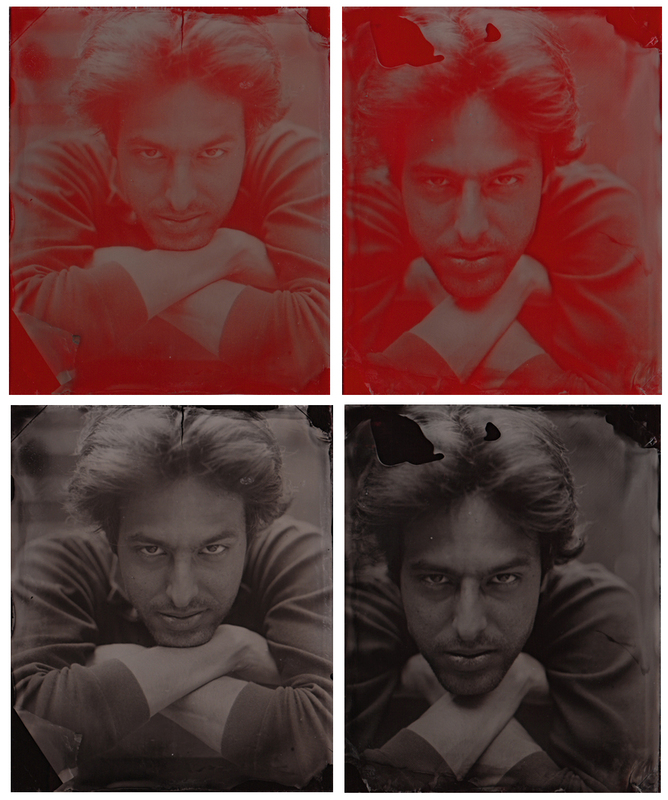 In Collodion it’s not all that uncommon to experiment with different colors of glass. A friend of mine recently told me that all of these colored variations are called rubytypes, even though the color is not ruby red, but it happened to be so in my case. Two days ago my brother visited me and I had a day off so the perfect opportunity to try some of these. The first I noticed was that the collodion peeled off way too easily with these plates. They had the same treatment as the black glass which I also bought that day and they came out just fine. It was like the collodion just wasn’t willing to stick to the glass. Anyway, will have to look into that some more, maybe treat the edges with albumen to keep the collodion from peeling. Anyweez…the results were quite pleasing! The first photo I took (on the left) is qua composition the most appealing to the eye but was a tad overexposed, which I adjusted with the second plate (on the right), but unfortunately the peeling was worse. Black glass has deeper blacks but with the red glass the blacks are deeper, meaning they are more dynamic. They have this special look which is impossible to convey on a screen with a scan, you’ll have to do with it. Below I’ll post the way they look when held to the light and when scanned with a black backing. Ruby red. Lovely red. This entry was posted on June 16, 2011 by Contrastique. It was filed under Wet Plate Collodion-Photos and was tagged with glass, rubytype, wet plate collodion. boiling water to steam the surface and pour the albumin over it just like you would collodion. Put in a plate rack to dry. Then, pour your collodion as usual. The larger the plate, the more likely it will be to peel. If the plate is less than scrupulously clean, the substrate will help cover the sin and prevent peeling. I think this is easier than pouring around the edge and have literally never had a plate peel using a substrate. Thanks for the heads up on that one. I only heard about treating the edges with albumen to keep it from peeling. The funny thing was that the red plates which gave lots of peeling (also with a friend of mine and even worse than mine) were 4×5″ so rather smallish and the black glass 10×10″ had no peeling at all. I’ve some literature mentioning glass has the ability to absorb every chemical that it comes in contact with and it’s quite difficult cleaning glass properly to get rid of all this pollution. They mention flowing the plate on both sides with a solution containing one part nitric acid and 4 parts water to get rid of this. After the flowing rinse the plate with water, dry it and it should be fine. It’s just that I don’t have nitric acid in the house so I can’t try it right now but that might also work. Anyway, thanks a lot for your comment and to be continued for sure! I hate cleaning glass plates, so I’m always figuring out easier ways to do it. What I do now is put the glass in the dishwasher on the most aggressive heated cycle. This gets most of the oils off the plate which are probably what makes the collodion peal. Then I use “Bon Ami” kitchen cleaner and water to scrub them. It doesn’t scratch the glass and works well with just water. Then rinse with distilled water before drying so there are no spots. You can also use “rotten stone” and alcohol as a second step, but after the dishwasher, the plates are usually pretty clean. Keep up the good work, the ruby abrotypes look wonderful. Fascinating stuff. But why do you travel all the way to Tilburg for your glass? Also, how does one meter the light for a good exposure? Simple answer: price. All glass companies around me charge rather exorbitant prices for black glass. I found a relatively cheap one in Belgium at €75,- for a 120×60 cm plate ex vat but this company in Tilburg, Pfann, delivers the same size for €37,- in vat. Worth the drive to me. Once every two weeks they even deliver the glass to your door! Only I needed a batch fast so went to pick it up.